Is Cave Going To Release A Bullet Hell Shooter Outside Japan? 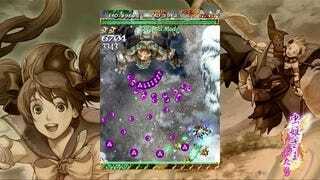 Japanese shoot 'em up developer Cave has brought several of its arcade shooters to the Xbox 360. Sadly, they've been Japan only. But that could change. In a recent blog post, Cave's Makoto Asada talks briefly about meeting with Microsoft and hints at a worldwide release for one of it's titles by discussing looking into support and whatnot for titles and mentions his desire to put out an English language project language. Thank you all for your mail. Here are the results of our Xbox Live Arcade survey. We have received many requests from our overseas users for region-free versions of our games. "Death Smiles" was released only for Asia, but the region for "Mushi-hime sama Futari" has not been decided yet. I believe it will be decided around the time of Tokyo Game Show 2009. We are very happy to have received so many e-mails from overseas. No, thank you! MUSHIHIME-SAMA FUTARI Ver. 1.5 for the Xbox 360 will be released in Japan on November 26.